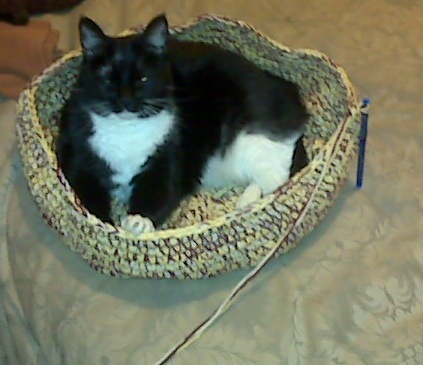 Soft, cozy, warm, durable hand crochet pet bed with liner. Large and comfortable enough for a medium sized dog or large cat. Crochet pet bed is approximately 7" inches high and 16 1/2" wide (approximately 53" around). Liner and top edging can also be crocheted with a cloth or cotton clothing (tee, scarf, socks - no dirty socks please :o)) that pet loves to cuddle with. Crocheted with soft cotton and sport-weight yarn combined. Can be created using multiple yarns or a single yarn color. Customize your pet bed with your own colors and style. Cat, Miss Tina Turner, shown stretching comfortably with eyes half closed while purring in pet bed pic (right) is a 14lb large 13-year old cat who is bigger than most medium sized dogs. Our self-appointed pet bed tester couldn't even wait until the bed was completed before jumping in and expressing her comfort. Negotiations were made to release the bed. Machine washable and dryable (unless special care yarn requested). Because there are so many color choices available, only basic colors are listed below. 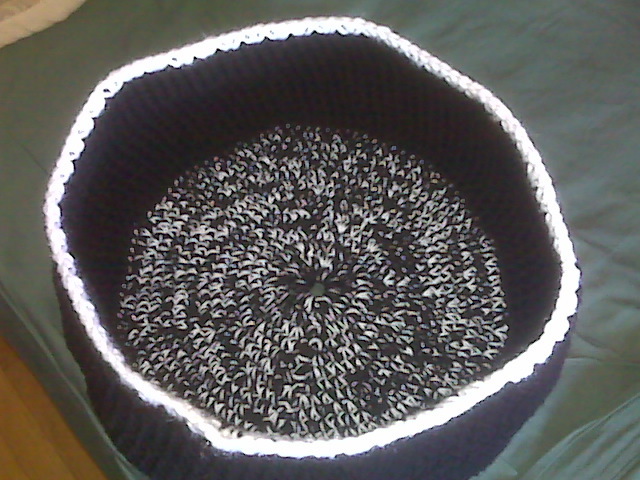 However, you may indicate any color of your choice for any area of the crochet pet bed. I bought a bed for our cat and she loves it, my wife loves i ..